Remake of Michael Winner’s 1972 B movie with Jason Statham in the Charles Bronson role: a car mechanic with a penchant for classical music moonlighting as a meticulous hitman. He’s instructed to bump off his friend and mentor Donald Sutherland, only for the old man’s boy to turn up and start asking questions. The boy is slightly psychotic, but The Stath trains him anyway as his protege, teaming up with him when revelations uncover a deadly plot within his own organisation. 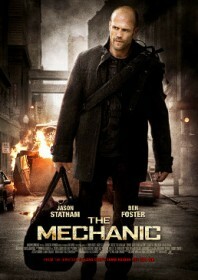 Statham makes a good stab at appearing sincere in yet another nuts and bolts action movie.